How to make super rich, creamy and cheesy scalloped potatoes that the whole family will love. Preheat your oven to 400 °F. Grease a 2 quart casserole dish with butter and set aside. In a medium sized sauce pan, melt the butter over medium-high heat. Add in the grated onions and cook until tender and soft. Add in the flour and stir until mixed throughout the butter. Stir for another minute, then whisk in the milk slowly, stirring with the whisk to ensure that there are no lumps. Season with the salt to your own taste (start at 1/2 tsp). Cook the sauce on low until smooth and thick, stirring occasionally with the whisk to ensure that the mixture doesn't burn on the bottom of the pot. Reduce the heat and stir in the cheese, whisking until it is smooth. Place half of the sliced potatoes in the casserole dish. 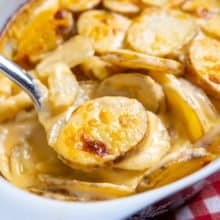 Pour half of the cheese sauce over the first layer of sliced potatoes. Repeat with the second layer of potatoes and cheese sauce. Take off the lid and sprinkle the remaining cheese on top and paprika if wanted. Bake uncovered for another 30 minutes, or until the potatoes are tender and cooked. If you notice the cheese on top getting too brown simply cover the potatoes again and keep cooking until tender.